A son of a son of a shrimper . 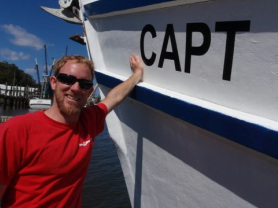 Patrick is a co-creator and all around mastermind of the Capt Gabby. He knows these waters like he should and loves to show folks around. Patrick also prides himself on his culinary skills, so expect some fine meals when he is on board. If everyone is lucky, he will catch dinner! Once you get to know Patrick you feel like you are getting to know the Georgia Coast. Cindy Dennard. Co-owner of the Captain Gabby and guide with 24 years of experience along the Georgia Coast. She loves it here... Also co-owner of SouthEast Adventure Outfitters, based on St Simons Island, Cindy has a finger on the pulse of exploring and fun on the water. Cindy loves to help plan the perfect trip for folks and does everything she can to make it a reality. Robby Bufkin is a co-owner of the Capt Gabby and a Georgia boy through and through. He might have been born on a boat... His other hat is worn as manager of SouthEast Adventure Outfitters on St Simons Island. This guy knows how to plan an adventure for you. Robby also loves to laugh and fish! 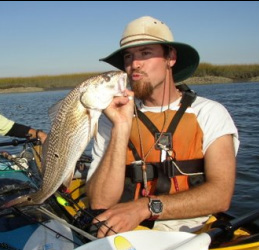 Clement Cullens loves to fish. Among other things. He has been a guide along the Georgia Coast for 15 years now, but has been training since birth. Clement is as comfortable on the water as off. He loves exploring and sharing his amazing home town with new friends. Capt Willy Hazlehurst could be your guide if you can catch him in town. His other jobs working for NOLS and Little St Simons Island takes him guiding around the world. Georgia is home, though, and he can show it like no other. Willy is a foodie, a fisherman, an earth-lover, and an amazing photographer. Capt Moss Xiques comes with an interesting name and some amazing talents. Moss loves to fish, boat, and explore the Georgia Coast. He spends most of his time learning more about the flora, fauna, and history of the unique environment we are lucky enough to share.